Petunia got her staples out today and was a very good girl. We are very lucky to have a wonderful vet like Melanie Thomas who is willing to come to the shelter to help us with the pets. 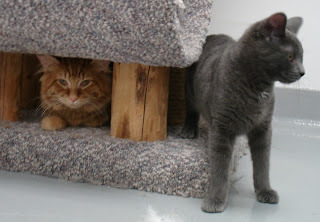 Yesterday Maurice and Jessamine (that's them in the photo) were adopted by a very nice family!